Roadways construction affected the natural water drainage and blocked canals since 1980. Recent restoration works has infused life back into two villages in Madhuban Gram Panchayat. Water logging has been a persistent problem for farmers in the coastal areas of Puri, Odisha. Construction of national highways has affected the natural water drainage system and has changed the lands of thousands of farmers since 1980. Nobody noticed that the Ratnachira river and other natural canals that led to the Chilika Lake were also torn apart in the process of constructing roads. “Before 1984, the people of my village were happy. There was food to eat, safe water to drink, plenty of fish in the rivers and enough milk to go around from the cows we kept. 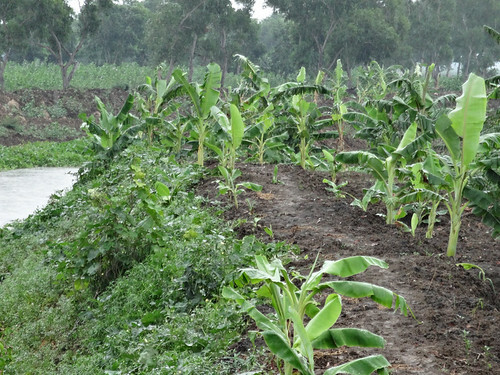 But after the government constructed an irrigation canal in the area, the economic condition of the villagers deteriorated, and the entire area was waterlogged leading to agriculture going for a toss”, says Jagabandhu Biswal, a 60-year-old resident of Mauza in Madhuban Gram Panchayat, Puri. In the last two decades, illegal construction works in critical areas of the Ratnachira has affected water availability for the farmers. The irrigation canal did not provide water when farmers in the area needed it. However, water would suddenly come in when the farmers were ready to harvest their crop. A flood-like situation has severely affected crop production. However, matters continued to worsen as people started constructing buildings in the river basin area, violating all rules. “The flood of 1982 brought in water hyacinth that has stayed with us and grown ever since. The Super Cyclone of 1999 destroyed all our coconut trees and spread a disease that still affects our coconuts. Life became miserable and we abandoned agriculture altogether. Our village became an island in a river”, says Rabindra Swain, a 68-year old farmer from Dahana village. “Before 1980, Mauza had 2500 acres of fertile agricultural land but in just two decades, agricultural production declined to such an extent that most of the farmers in the area were struggling for their survival. The two canals made by the government had filled with silt and were heavily infested with water hyacinth. People had even forgotten where the channels began and where they ended,” says Pratap Panda, Programme Manager with Regional Centre for Development Cooperation (RCDC). In 2014, RCDC in collaboration SWAD, through a project named “Prayas” helped the villagers of Mauza and Dahana in Puri by providing financial and technical support for cleaning the irrigation canals. Prayas is a Hindi word which means "effort". The objective of the project was to reduce people’s distress from natural disaster, primarily arising out of flooding and climate change; and improve socio-economic and environmental security through integrated community-led efforts in disaster-prone Puri. The cost of the project was Rs.31,82,948, which was funded by AusAid and UNDP. The project, which ran for 16 months from Dec 2011 to March 2013, was implemented in Madhuban and Sukal Gram Panchayats of Satyabadi Block in Puri. Introduction of integrated farming (paddy cultivation (line sowing) + vegetable farming) and encouraging use of flood reslient indigenous paddy varieties. Renovation of an agricultural channel. The Khabar Nala was renovated with community support which removed water logging and could bring 2100 acres under cultivation against the earlier 700 acres. With the help of village elders, the expert team appointed by ‘Prayas’ surveyed the area and traced the meandering route of the canals. The first canal was slightly more than 1 km long, started at Khalashi muhana and ended at Adheimana. The second was longer, a little more than three km long, starting at Kumuti muhana and ending at Baismana. After the tracing of the route, the villagers took it upon themselves to clean the canals, both by excavating the silt and removing the water hyacinth. “After the implementation of the Prayas project, it was like a dam being opened. The water rushed out with tremendous force, and suddenly the stagnant water vanished”, says Rabindranath. People started considering taking up agriculture once again. It was not easy after a 32-year hiatus. The losses suffered all these years were still heavy on the villagers minds. However, people started returning to their fields. The farmers began planting horticultural trees and vegetables on the raised bunds of the canals. The villagers economic condition once again started improving and boosted their confidence. “Now around 1200 acres of farmland in the area is ready for the next crop of paddy. If things go well this season, we will irrigate all 2500 acres next year. Who knows, our children who have migrated may return once again. A good income this year would only mean that we will be able to start repaying our debts. We have a long way to go to before we can see profits coming our way”, says Rabindranath with glittering eyes.